The long and chequered history of the "Green Vault" in Dresden's residential palace goes back to the year 1547, when elector Moritz initiated the building of an additional west wing to the palace. 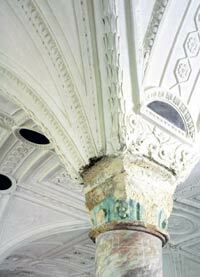 Four of the resulting rooms in the new wing's ground floor were given elaborate, molded plaster ceilings. The walls, column bases and capitals were painted with a characteristic, bluish-green paint containing malachite – a crystalline mineral found only in mountainous regions, which could be ground to form a usable pigment. Because of this, the rooms were soon known as "The Green Vault", and the name has remained ever since. The rooms of the vault weren't actually used as a "secret treasure chamber" until the rule of elector Christian I., the son of the financially and politically successful elector August of Saxony. Important documents and jewelry, precious metals, as well as artworks of great, material value – these were the fruits of flourishing trade and a strong handicraft and silver mining industry – were hence stored here. Christian's descendants further expanded the stock in the art and silver chambers to include myriad, outstanding works of goldsmith handicrafts. During the reign of elector Friedrich August I., whose rule in Saxony began in 1694 and who was even named August II. King of Poland in 1697, the use of the "Green Vault" changed decidedly. The once "secret chambers" were turned into a public museum, one of the very first of its kind in Europe! The elector-king – today better known as "August the Strong" – could now effectively exhibit his entire collection of valuables, including works of silver and goldsmith art, bronze statues as well amber and ivory workings, to his royal subjects. 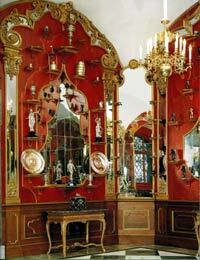 The furnishings of the eight rooms carried his unmistakable signature. From 1723 to 1730 the royal department of building and planning, headed by the "Zwinger" architect Matthäus Daniel Pöppelmann, planned and built a breathtaking, museum-like, artistic structure of German baroque grandeur, which was soon to become exemplary for museum history the world over. After having paid an admission fee, groups could then take guided tours through the chambers, viewing works of art being freely exhibited without physical barriers - an absolute novelty for this time and age, and not exactly what one would consider risk-free for the exhibition pieces! The viewing sequence in the museum's various chambers was even staged in a somewhat theatrical manner, the fundamental principle being the presentation of objects grouped according to their materials, and in well-selected color schemes. The “Jewel Chamber”, as well as the adjacent “Bronze Room” and “Coat of Arms Room”, fell victim to the devastating firebombing of Dresden on February 13th, 1945. All three rooms were completely gutted. 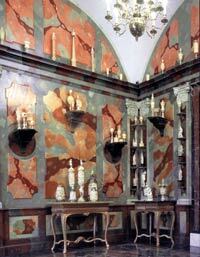 The most splendid room of the Augustinian “Green Vault” museum no longer existed. Thereafter, a “sleeping beauty’s” slumber of several decades followed in the ruins of Dresden’s residential palace. Fortunately, the art treasures themselves had previously been moved in 1942 from the “Green Vault” to a safer place of storage. At the end of the war in 1945, those treasures were confiscated by the Red Army, and it was not until about 1974 that approximately one-third of the artworks could again be exhibited in the rooms of the Dresden Albertinum. Finally, in the mid 1990’s, the preparations could begin for the return of the “Green Vault” treasures to their original place of safe keeping in Dresden’s residential palace – a process which reached its ultimate and brilliant conclusion, marveled the world over, in September of 2006. The tour began with the "Bronze Room", named so for the numerous and precious bronze statues of the Renaissance period as well as for the hundred or more figures or figure groups of contemporary bronze art on display there. 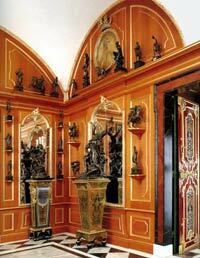 The "Ivory Room", a chamber of warm hues with "marble" painted, wood-covered walls, delighted visitors with a great variety of carved art pieces and small statues - all made from real ivory. Silver artworks, including the modern, silver table service of the elector-king, impressed viewers in the so-called "White Silver Room". Vermillion-red lacquered wall coverings formed a striking contrast to the silver exhibition pieces, which were displayed in front of numerous, mirrored surfaces. 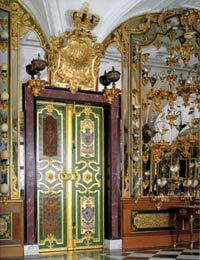 In the adjacent "Gilded Silver Room", pieces of gilded silver as well as solid gold drinking vessels and works of art were positioned in front of green lacquered, richly mirrored walls. Now the gradually increasing grandeur of the "Green Vault" could reach its first climax in the largest room on the tour, the "Precious Hall". 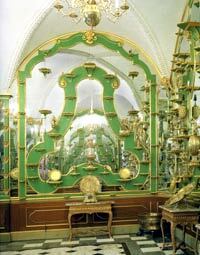 In this completely mirrored room one could view vessels made of colored gems and amber, mussels and ostrich eggs atop settings of gilded silver, all effectively presented on magnificently carved consoles and delicate tables. In addition, the northernmost wall presented an unusually diverse collection of artworks made of mountain crystals. Adjacent to the "Precious Hall" was a small "Corner Cabinet", where hundreds of miniature figures and figure groups made of pearls, emeralds, sapphires, ivory and enamel painted gold were closely arranged on consoles and wall tables. Being surely dazzled by the pomp and grandeur of the "Precious Hall", the visitor could then progress into the "Coat of Arms Room". As the name suggests, here were various copper and gilded coats of arms of the Saxon provinces, the Polish state coat of arms and the initial plates of the Wettin electorates, all of which had been mounted onto the walls' solid oak paneling. The "Jewel Chamber" housed not only the crown jewels of the Saxon-Polish royalty, but also various rings, chains, medallions and gems in four, large, wall cabinets. 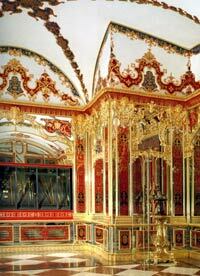 Even the architecture of the "Jewel Chamber" was decidedly pompous, in keeping with its precious contents. 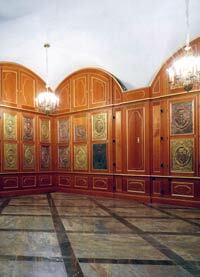 The wall and floor moldings were mirrored and decorated with ornamental spaces of gold inlay on blue and carmine red backgrounds. With the furnishing and exhibition of the rooms in the "Green Vault", the elector-king was in a position to unmistakably document his extensive claim to power as well as the Wettin family's glorious past. The "Green Vault" was not only a place for August the Strong to hoard beautiful works of art, but rather an impressive opportunity for royal self-presentation and demonstrative proof of Saxony's economic and artistic capabilities.